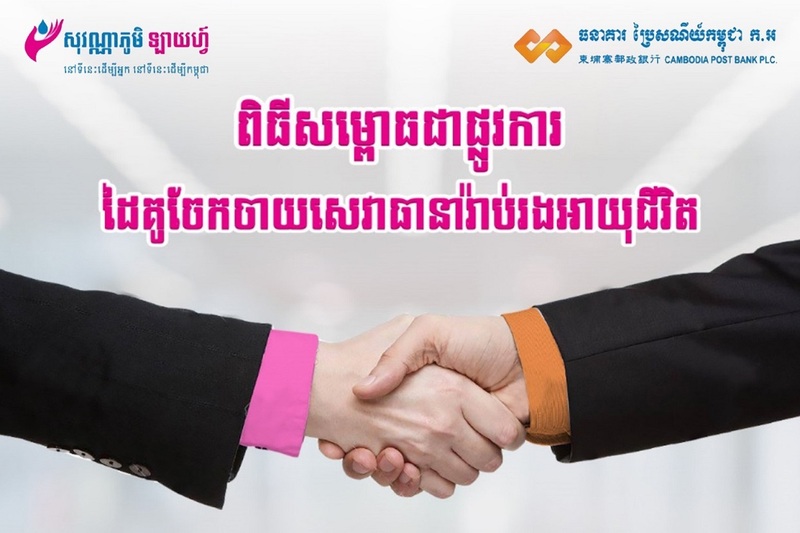 CP Bank is officially launched a partnership with Sovanna Phum Life Insurance in order to distribute life insurance services to Cambodian people. Friday, March 2, 2018 at Raffles Le Royal Hotel: Cambodia Post Bank Plc., is one of the leading Bank in Cambodia with a strategic partnership between Canadia Investment Holding Plc., Fullerton Financial Holdings PLC, Cambodia’s Ministry of Post and Telecommunications, had officially launched of Life Insurance dealing partnership with Sovanna Phum Life Insurance Company which is a local company with joining between Canadia Investment Holding Plc., and the first level of Thailand Life Insurance Company, namely Moeung Thai Life. The event was attended by the company’s CEO and senior management of both companies for collaboration to make a more convenient for CP Bank customers to get a free consult about the insurance service with a consultant of Sovanna Phum Life Insurance Company in every branches of CP Bank throughout the country. In addition, the bank always seeks to find new products and services in response to the needs of the Cambodian people today. Obviously, like a cooperation with Sovanna Phum Life Insurance as a sharing life insurance for the Cambodian people.